We haven't found much information about this video you are about to see. It seems to be a trailer for an independent movie still in production. The plot deals with an amnesiac man and his beautiful, mysterious psychiatrist.The trailer show different images from a hypnotic session, including the induction and the awakening. And we will only say 3 words: dangling key induction. We definitely want to know more. It certainly looks promising. This is also our first entry about female hypnotists, something you can definitely expect a lot more of. 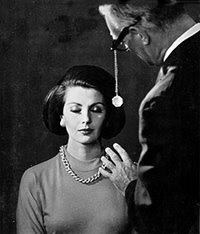 The Hypnotic Appreciation Society is not a female dominant hypnosis site in any way; there are plenty of those. This site deals with hypnosis and glamour, and it's hard to decide what is more glamourous: a beautiful hypnotic subject, or a beautiful hypnotist..
Really enjoyed your posts. I have a self hypnosis site I think you might enjoy. Let me know what you think. Seinfeld: The only comedy television CHICO AND THE MAN on this list, the Seinfeld complete series is extremely popular. This longstanding CHICO AND THE MAN DVD COLLECTION show may go down as one of the best sitcoms in history, and CHICO AND THE MAN DVD an iconic show that everybody can relate to. Hardy clothing takes its name from the man who inspired the line, hardy shirt is an American tattoo artist raised in Southern California. He became recognized for incorporating hardy shirts aesthetic and technique into his American style work. Hardy is considered one of, cheap hardy shirts , the casual clothing, and best tattoo artists in the world “the godfather of modern tattoo” is the name of hardy gave by tattoo circles. A company that can make scarpe Hogan in many departments is usually the best choice, since they are able to adapt their hogan donna designs to fit the latest Hogan scarpe uomo trends and technologies in sports. Even though Hogan uomo are associated with sports, they also have a nice line of fashion shoes that women and men alike will appreciate. The Hypnotic Appreciation Society is for those who find seduction and sensuality in hypnotism and the hypnotic process. For those who encounter mystery and fascination in watching a beautiful subject falling into a deep trance, or a beautiful hypnotist slowly putting her subject to sleep. The Society is not about dominance, but glamour. Welcome. If you have videos, images, text or links of interest about sensual inductions, vintage hypnotism, classy hypnotists or any topic featured on this blog, please let us know. We'll be very happy to include them on the site.